This New Toyota Supra Report Can't Be True, Right? As of now, Gazoo is Toyota’s consolidated motorsports division, and in Japan, at least, limited-edition Gazoo-tuned cars that are badged as “Gazoo Racing Masters of Nürburgring (GRMN)” and G’s. The head of Gazoo Racing, Koei Saga, told Autocar that their road car development team was already using hybrid technology, which does strongly suggest that the new, eagerly-awaited Supra may incorporate a hybrid drivetrain. So far, the BMW-Toyota joint venture Supra has been suspected of having some sort of twin-turbo V6 powertrain, but there’s been no real evidence to suggest that the car will be a hybrid. Saga refrained from revealing what Gazoo’s range-topping model would be, but earlier inside information has suggested that the Supra was already planned to be launched under the Gazoo monker. Whether or not this will be as the Gazoo Supra or Toyota Supra Gazoo isn’t yet known. Seems like a bit of a reach, no? To be honest, I’m pretty skeptical that Toyota will launch a performance brand in America with the name “Gazoo.” As much fun as I may think the name is, I’m an idiot, and most Americans are going to think of kazoos or the alien from the Flintstones or the legendary human orifice that often has things coming from it known as the wazoo, pretty much anything but a premium performance automobile. As far as the hybrid tech goes, maybe? 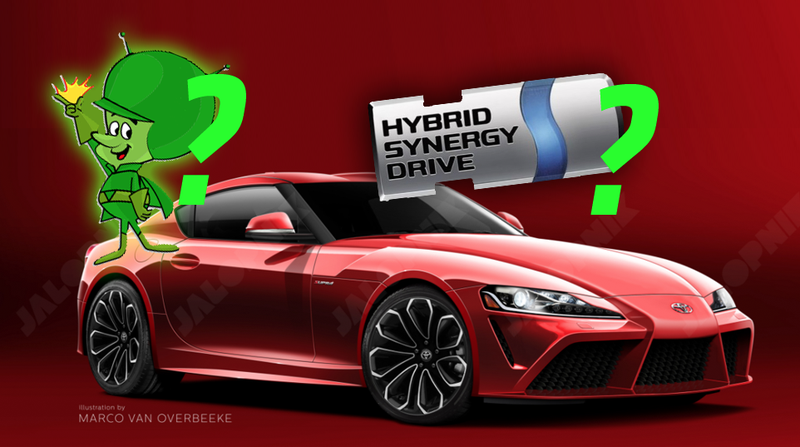 It also may be that Saga was referring to a possible hybrid racing variant of the upcoming Supra instead of the production model being a hybrid. A hybrid version of the Supra isn’t all that improbable, but I’m not so sure it’ll be a fundamental part of the car. But who knows; the new Supra and the BMW Z5 (if it’s called that) will share a platform, so perhaps some manner of hybrid tech will be an additional differentiator of the Toyota? So, overall, let’s just say we’re pretty skeptical about everything in this Autocar story. There’s essentially zero evidence to back up anything about Gazoos or hybrids, so, Toyota dealers, you can relax. Cancel your orders for GAZOO license plate frames. If they do it, we can call it a "Gazoopra."